I love this title by Stan and Jan Berenstain. 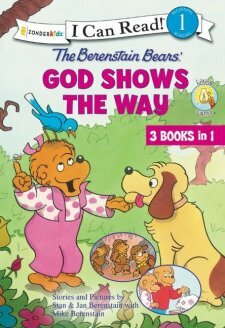 It brings the beloved Berenstain Bears to my newly reading five-year-old in a I Can Read Level 1 book. This particular title is three books in one. It includes, Faith Gets Us Through, Do Not Fear God is Near, and Piggy Bank Blessings. Each selection tells a faith based story with an easy to understand bottom line. My favorite of the three was Do Not Fear, God is Near. My son often struggles with being afraid. I feel this must be common at his age, but I would still like to empower him with the ability to overcome his fears. For our family, knowing God is our protector is the best avenue. These books are great because they are a teaching tool for my kids. My son sat with me as we read all three and he was delighted. With all of the options in reading materials for early readers, I love chpices like these three books. They provide a positive message with long loved characters. The illustrations are clear and just as wonderful as the original series. I feel the age range for this book is 4-6. My seven-year-old has not shown any interest in this title. I was given a complimentary copy of this book by its publisher and BookLookBloggers in exchange for an honest review. I have not been compensated.